Final Exterior Prep Begins……Into the Post Season We Go! …..and how about those Mets! Hope is in the air for us Met fans out there. After winning the divisional series against the Dodgers they went on to win game 1 of the National League Championship Series against the Chicago Cubs 4-2. What a great game. It always helps when you win though doesn’t it? I think the late game time starts are wearing a bit thin on me though. Staying up to 11:30 at night is definitely not what I’m used to. Cheers for all you Met fans out there. So as I was saying, these late nights are not what I’m used to. So my late night baseball watching turned into a late morning wake up on Saturday. Actually there wasn’t a game Friday night but Terence had a Friday night football game over in Cold Spring, New York in which he played really well. They lost a close game to the Blue Devils in which one turnover led to a score which was really the difference in the game. It was a fun game to watch though. But I went to bed at around midnight. So I got a late start over at the house Saturday. The goal was to begin getting ready for backfilling. Like I have said before, there are a lot of little minor details we have to get done before we back fill so it’s important we get to those little things soon. On the north side I started patching this huge honeycomb we had in the curb shelf which had left the styrofoam exposed. It really wasn’t a honeycomb but more like a huge void. What happened here was I put a horizontal rebar across the top of the curb to tie it all together. 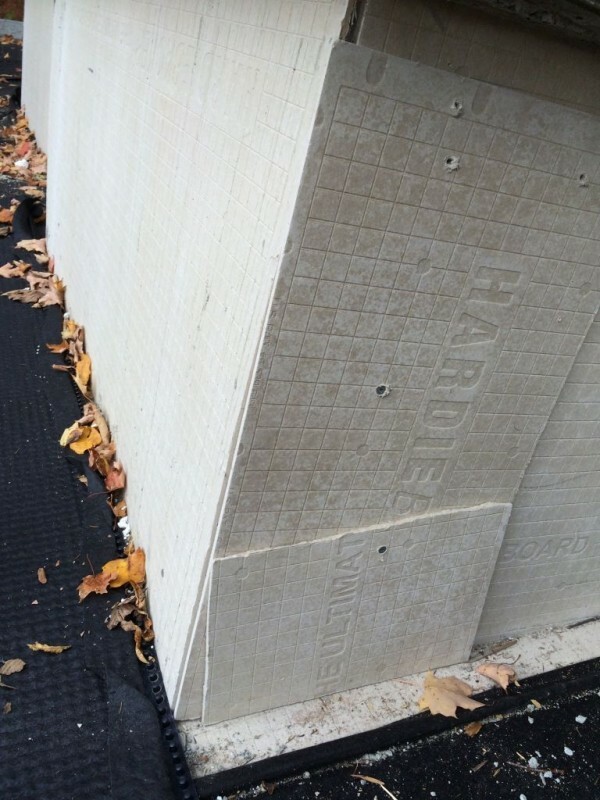 When we went to pour this 4 inch wide curb the stone got stuck on the rebar and didn’t fill the form up properly. This was the day I was troweling the stairs while Ethan and his friend Egzon were filling this up. Once it’s filled it’s really hard to tell if the form is filled up properly. Here’s a picture before I patched it. Void in north curd shelf. Pretty bad huh? The other item I patched was around the chimney base. When I poured the chimney I set it on a styrofoam base. My worry here is that vermin will dig through the soil and enter my styrofoam roof and set up shop. So all I did here is put a little cement based cant all the way around the base. Pretty simple. Check it out. 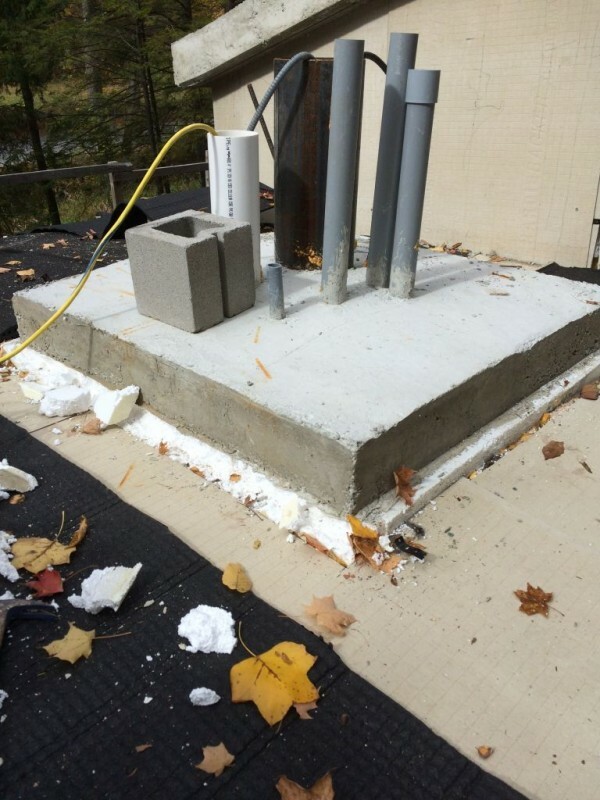 Chimney base with styrofoam exposed. Chimney base with cement based cant to shed water as well. I think this will cover our bases as far as the critters are concerned. One final item I was able to finish was the cement board around the skylights. There were a couple of places where I wasn’t happy with the way things came out. You have to remember we’re using unskilled labor here and it’s not that easy to do some of this stuff. The one I did took me a while to do and you really did have to use your head to get it right. Jude and Zach did a good job though. I’m not really sure how I’m going to finish this off but I wanted to have a good seal around the skylights before we covered everything with soil. Check out a few pictures.. 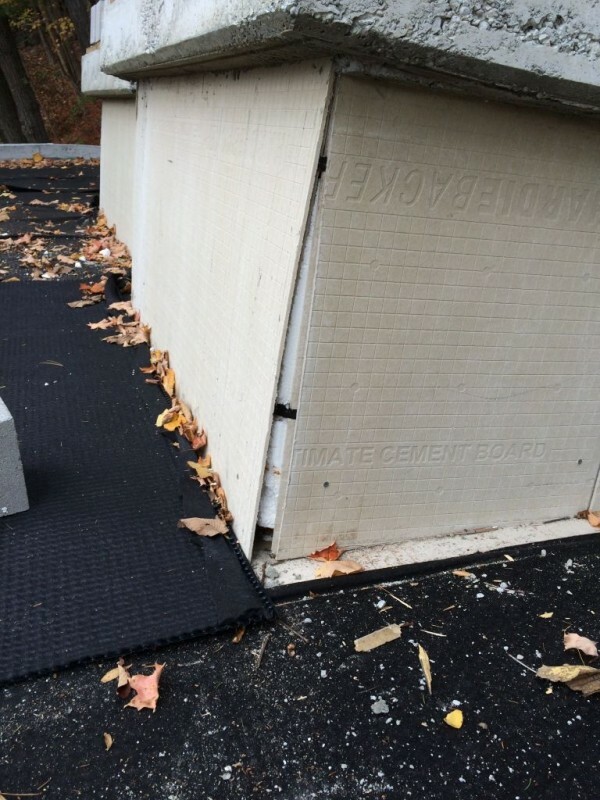 Corner gap in cement board around the skylights. So the smaller board I put in will never be seen. this board will actually be below the soil grade. I’m also thinking about doing some kind of a corner board detail for the skylights later on. We’ll see. So just one other item I want to show you. 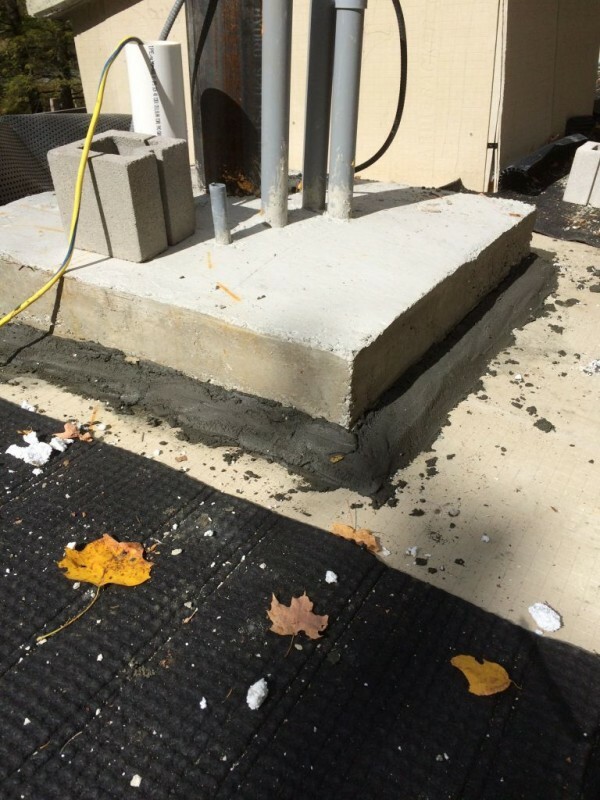 The idea behind the cement board is to seal the styrofoam insulation from rodents and the like and to protect it, as well. I’m not sure how well that will work over time but we shall see. So holding the cement board in place will be the soil itself and the concrete we poured around the top of the skylight. 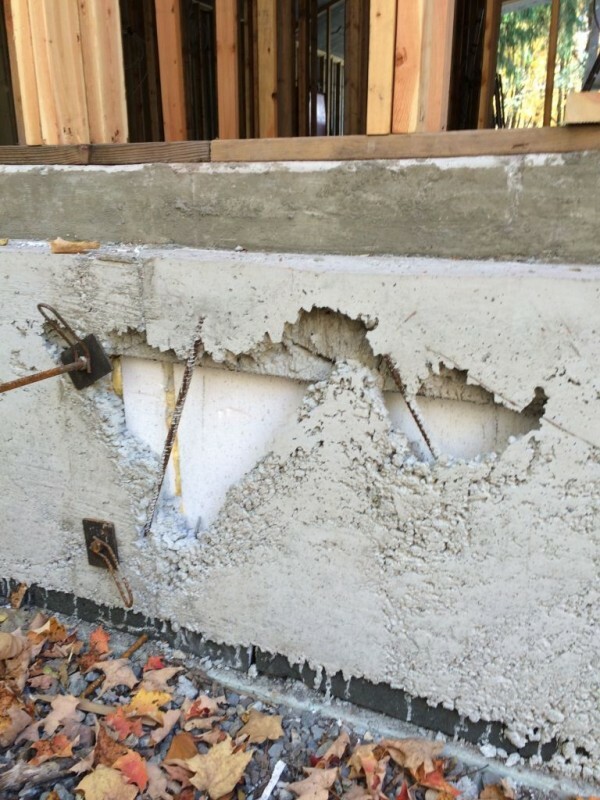 I embedded the cement board into the concrete so it’s completely sealed around the top. Here’s a picture. 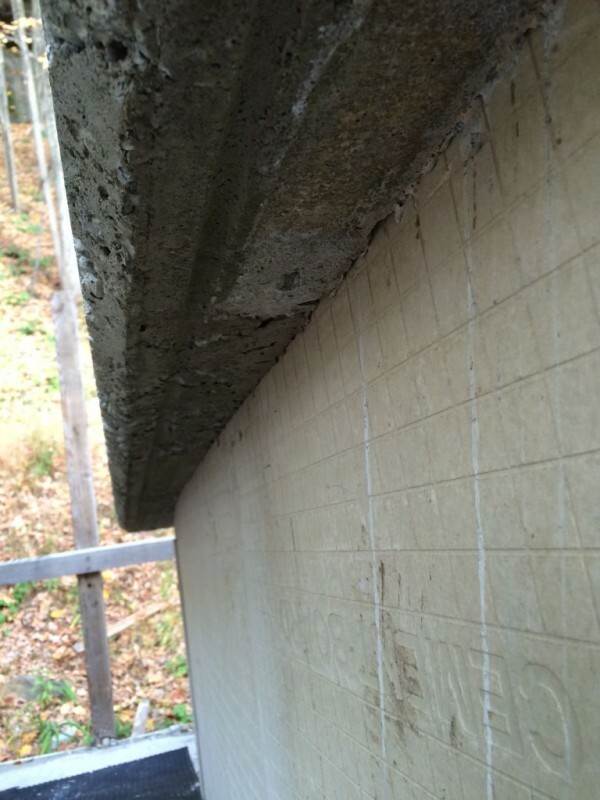 Cement board completely sealed around the top. Embedded when we poured the slab around the top of the skylight. So I’m hoping that next week I’ll be able to finish up the minor details before we backfill. Not too much left. A lot of little things all around though so it’s time consuming and it won’t be easy. Let’s go Mets and see you next week!